Last week I had some beets leftover that needed to be used and decided to use them up in one of my favorite ways - as chips! Beets are really the perfect root vegetable to make chips with. They turn out crisp and crunchy while not having a completely overwhelming flavor. In fact, if you closed your eyes and ate one, you might not even know it was a beet at all! Beets are truly one of my favorite vegetables, mostly because of their beautiful colors and versatility. I really don't think I've ever met a beet that I didn't like, but these chips are quick, easy, and simple; with just 2 ingredients needed. Now, I used traditional red beets here, but you could also use golden beets to get the same basic chip which may even look and feel more like a regular potato chip. One of the best things about these chips is that they are completely customizable. So feel free to add and try out more seasoning options than just the sea salt that I used. These aren't just for adults either. Kids love them too! Yes, they do look a little different BUT since their such a pretty color I haven't had any issues with getting my little girl to try them out. I honestly haven't come across anyone yet who tried these and didn't like them! Preheat the oven to 325 degrees F. and line a baking sheet with foil or silicone baking mats for easy cleanup; coat lightly with non-stick cooking spray and set aside. Scrub the beets clean and use a sharp knife or mandolin to cut the beets into very thin 'chips'. 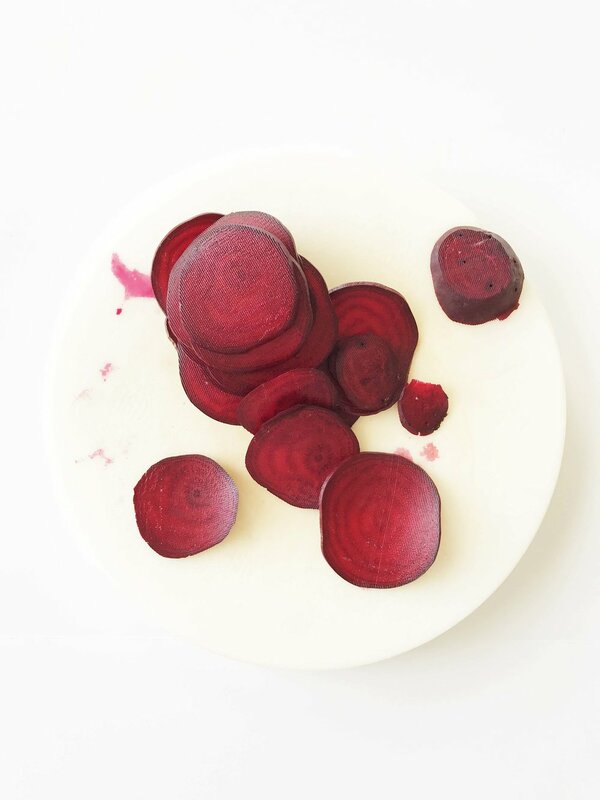 Toss the beet slices into a large bowl along with # extra virgin olive oil and set aside for about 15 minutes to soak. This lets the beets release their natural juices so they are sure to hold a better shape and crisp up nicely! When they are done soaking, drain them and place the beet slices in a single layer on the prepared baking sheet and sprinkle with a bit of sea salt. Put the baking sheet into the oven and bake for 45 minutes or until the beets are starting to crisp and look dry. Once done, remove the baking sheet from the oven and allow the beet chips to cool completely. When cooled, enjoy right away or store in an air-tight container for 3-5 days!